displays the current date on the page. If you use HTML instead, you must hardcode the date and consequently update the document daily. 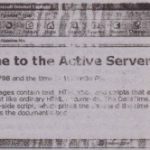 The VBScript Datet) function returns the current date, but VBScript doesn’t provide any methods for actually displaying the date on the page. To display something on a page from within its script, you use the objects of the Scripting Model. Notice that this document doesn’t contain any HfML tags in its BODY section. 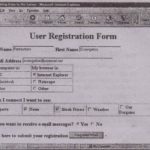 The entire document was generated from within the page’s script section with VBScript commands. In the following sections, we are going to explore the Document object of the Scripting Model, since this is the most important one from a VBprogrammer’s point of view. that demonstrate the syntax of the propeties. The Document object provides a few simple properties that let you set the document’s background color, the color of the links, and so on. It also provides a few of the most advanced properties, such as the Cookie property, which lets your script store information on the client computer and read it the next time the document with the ‘script is loaded. bgColor, fgColor These properties return or set the document’s background color and foreground color. The foreground color is the color used for rendering text if the HTML code doesn’t overwrite this setting. Likewise, the background property can be overwritten by the document if it uses a background image. These properties accept color values. Title This property returns the current document’s title. This is a read-only property and can’t be used to change the document’s title at runtime. Cookie As you know, scripts written in VBScript are executed on the client com-> puter. VBScrlpt, therefore, had to be a safe language. There is no way for VBScript to access the file system of the client computer and tamper with it. That’s why VBScript lacks the file I/O commands of VISUal Basic.A language that can’t store information locally is rather limited. Scripts can’t even open or save dew bytes of data on a local file, and for many applications, this is a serious limitation. Another practical reason for using cookies is to share information among pages. The shopping basket is a typical example. As you know, a script is limited to a single page. If the page with the script loads another page, the original script ceases to exist. The script (if any) on the newly loaded page takes over. Some sites let viewers select items to purchase on various pages, and they keep track of the items in the user’s shopping basket. If each page is a separate entity and the pages can’t share information, how is this done? The answer is the Cookie property of the Document object. 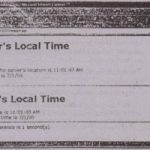 When a page wants to pass some information to other pages, it can leave a cookie on the client computer. The page that needs the information can read it. 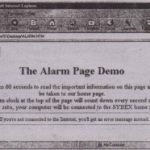 To the viewer, it appears that the various pages are communicating as if they were Forms of an application, to use a Visual Basic analogy.